The tear-shaped island lies in the Gulf of Thailand, 45km west of Ha Tien and 15km south of the coast of Cambodia. It’s no lightweight: at 48km long (with an area of 574 sq km), Phu Quoc is Vietnam’s largest island – about the same size as Singapore. Phu Quoc’s rainy season darkens skies from late May to October, when the sea gets rough and a lot of diving stops. The peak season for tourism is midwinter, when the sky is blue and the sea is calm, but it can get pretty damn hot around April and May. Fringed with white-sand beaches and with large tracts still cloaked in dense, tropical jungle, Phu Quoc rapidly morphed from a sleepy island backwater to a must-visit beach escape for Western expats and sun-seeking tourists. Beyond the resorts lining Long Beach, it’s still largely undeveloped, so there’s ample room for exploration and escaping. Dive the reefs, kayak in the bays, eat up the back-road miles on a motorbike, or just live the life of a lotus eater by lounging on the beach, indulging in a massage and dining on fresh seafood. Enriched with the flavor of the sea, the sardinella salad is loved by many people. 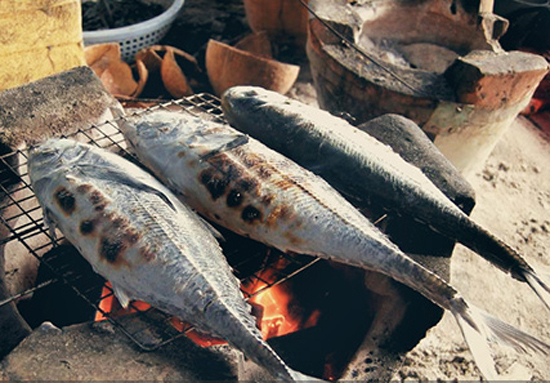 This bucolic meal, yet elegant, is the reason why so many people come to Phu Quoc every year to enjoy the sea and the delicious sardinella salad. After washing and removing the fins, the chef will have to slice the sardine into thin many very slices. Then he or she will use lemon juice, thin sliced chili, sliced onion to mix with the sardines. 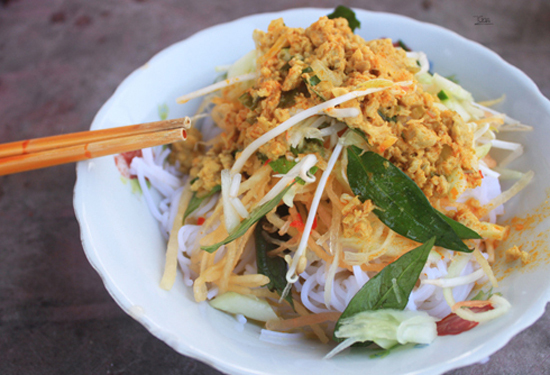 Rice paper, herbs, and dried coconut meat are essential to this dish. Eating the sardinella salad, it is required to have both the home-grown vegetables and the herbs from the jungle. There are total 8 types of herbs while the home-grown vegetables including salad, basil, and many others. When eating the salad, you can taste the soft, and a bit sour of the fish, the fat of the coconut, and peanut, and the bitter of the jungle herbs. The herbs or its bitter will help food lovers who haven’t eaten salad with coconut milk from having a stomachache. 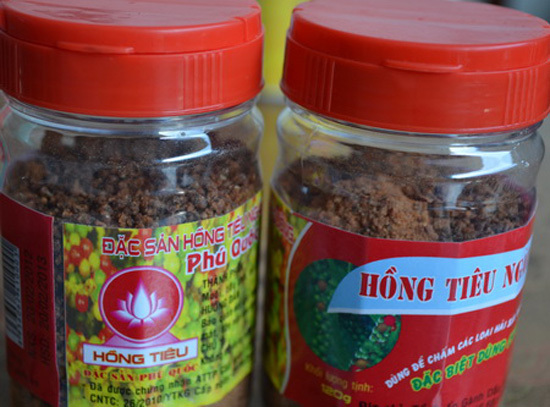 The rice papers from Phu Quoc, big and limber, are also quite different from many other regions. Because of that, when making the rolls, the rice paper won’t be broken. This is also a special feature of the rice paper in Phu Quoc. The sauce is also special. Made of chili, garlic, fried peanut, the sauce is a harmony combination of fat and chili, sour and sweet. Food lovers will have to come back for more. Last but not least is the wine to drink along. While the fish is nutritious, it can be tough to the digest system. A bit of Sim Wine will help you eat better and tastier. 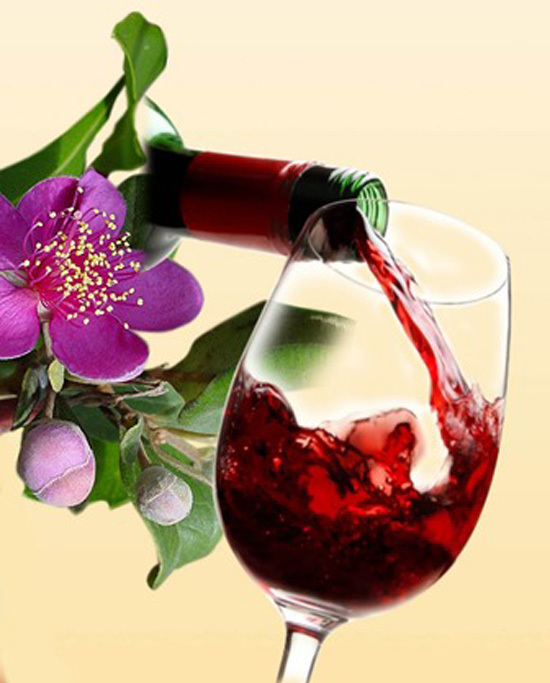 As one of Phu Quoc finest wines, Sim (the Vietnamese name of Rose Myrtle) is also rated as one of the best wine in Vietnam. The wine is made of the ripe Rose Myrtle and a little bit of yeast, and has a very special flavor. The jungle Rose Myrtle is uniquely special because of its bitterness combines with sweetness. Phu Quoc has a cool climate, suitable for the Rose Myrtle to grow all year, but it only ripes on the first month of the lunar new year. The rose myrtle, when it was growing had a color like rose, but when it ripped, the color turned purple. The wine is not only a drink of nature but also a cure for many types of illnesses. It helps the drinker eat better, sleep better; strengthen the muscle of the elders, diarrhea, digest illnesses. It also helps patients with kidney diseases. 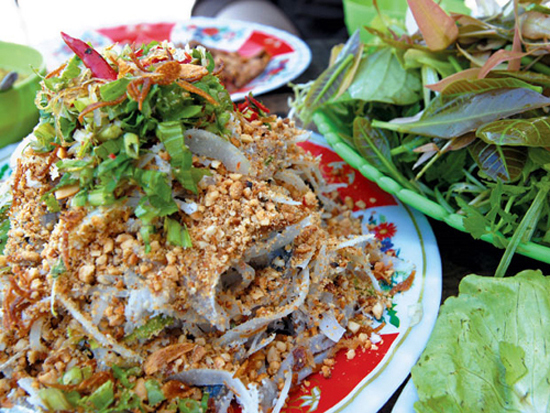 Còi Biên Mai is a type of snail that should to be missed when visiting Phu Quoc. The snail, thanks to the creative mind of the locals, can be turned into many dishes, which are all equally delicious. 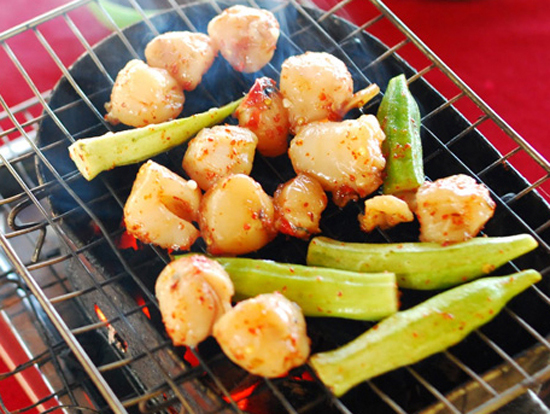 There are many recipes for the snail such as sweet-n-sour fried, steamed, soup, or hotpot, but the best is the chili-salt grilled snail or the spicy tofu and lemongrass grilled. The snail can be easily found in the night market at Master Phu Quoc Palace or at almost any restaurant in Duong Dong Town. Grilling the snail requires technique and timing. As soon as the snail turns from milky white to yellow, it is ready to be served. If grilling for too long, the snail will be tough and dried. The snail is perfect if it is served with grilled corn, herbs such as basil, lettuce, salad, raw banana, cucumber, pineapple and dipped in spicy tofu or salt-n-chili lemon sauce. You can also roll it and dip into the fish sauce. In any form, it is just irresistibly delicious. Many people know about the famous sardinella salad but not about the equally flavorful Jack mackerels. Not because it is less delicious or too hard to cook, but because the fish only arrives by the season. In the calm day of the sea, maybe you can catch a few but in the rough sea, it is impossible to find one. There are also many to make the fish but the best and also the simplest is to steam and dip in lemon salt-n-pepper sauce. You can also roll it into a fish roll with a little bit of herbs and you will want to make a second one. The grilled Jack is very different, sweet but not fishy, and the meat is a bit tough but just perfect. These features are not easy to detect, but only the mackerels of Phu Quoc possess these. 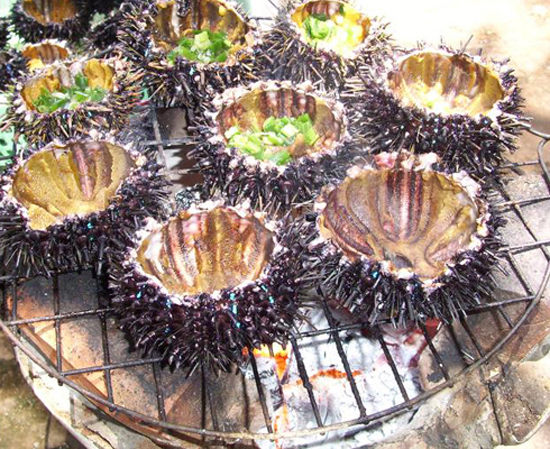 Sea urchin, or the spike ball, is a amazing dish that should definitely try when visiting Phu Quoc. Among many sea species, not one is as good as the sea urchin, especially its eggs. Splitting the urchin in half, the ball is hollow but there is meat stick to the surface. The meat has a yellow color like cream cheese. The best part is the urchin’s eggs, which are fat and sweet and to be considered as the gift of nature. The urchin is also known as the ginseng of the sea, which is very nutritious and good for your health. The locals cook the urchin in so many ways. The most complicated one is that they will take all the meat inside, fried with fat and garlic and drop all in the boiling pot of porridge. The urchin porridge is fat, sweet, and nutritious and it will help you recover promptly after many days traveling. The most common way is to cut the urchin in half, and grilled on the fire. Grilling the urchin a few minutes on the fire, removing the meat and dipping it in the sauce and you will never forget it. 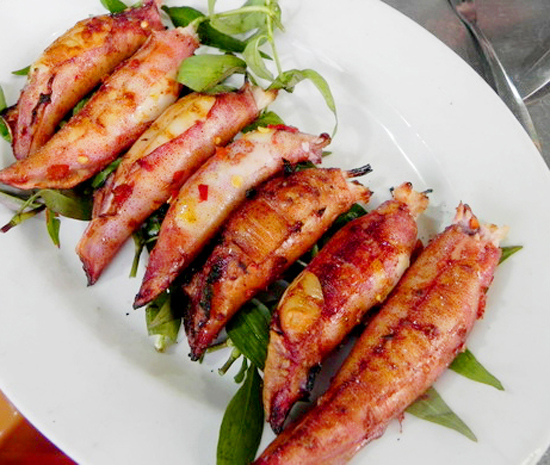 The grilled squid is a bucolic dish, just like people in Phu Quoc, simple and hospitality. The egg squid is bigger than the adult’s thumb with a belly full of eggs. The squid season is from February to May of the Lunar year. There are many ways to cook them. You can make porridge, steam, boil, grilled, fry, all are delightful in the same way. The squid needs to be cleaned first, seasoned with chili salt, cooking oil for 15 minutes for the seasoning to be absorbed. Lastly, putting it on the firing charcoal until the meat has a yellow color, adding some herbs and dipping the squid in the sauce and you will know that you are in wonderland. The crab rice is few things you have to try when coming to Phu Quoc. Tasting the rice, you will understand more about the earth, the sea, and the people who live between the two. 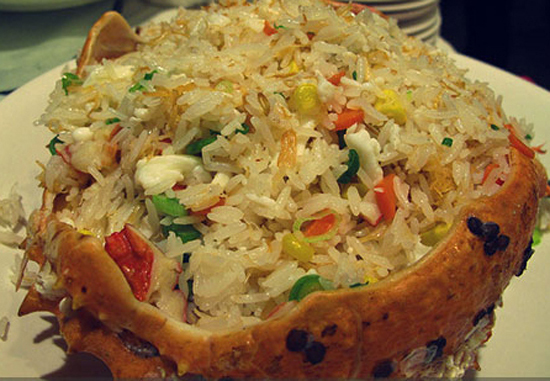 The main ingredient of the dish is rice, while the crab, mixed with garlic, onions, and bit of sauce will be the crown. The rice when finished will have a color yellow, and the rice is usually fat and the crab is sweet. You can choose some vegetable to eat with the crab rice such as cucumber or tomatoes and most importantly, the fish sauce that can neutral or increase any flavor. There are many ways to cook crab. You can boil and dip in salt-n-pepper lemon dip, grill, soup cake, hot pot. The best crab is in Ham Ninh, where the crab is small but the meat is solid and better than anywhere else. 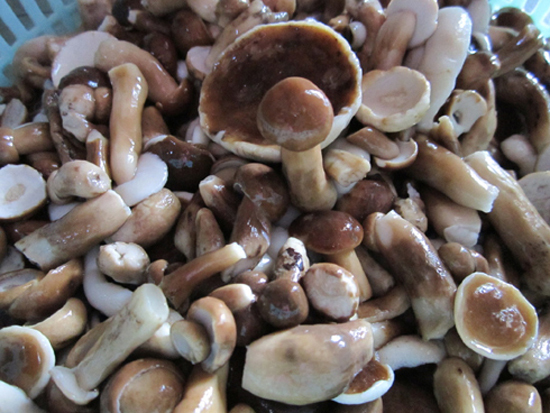 This type of mushroom appears a lot in the primeval forest in Phu Quoc, and it can be cooked with everything from chicken to fish and meat. Melaleuca mushroom grows only after the first rains in the mangrove forest. The leaves from the trees will fall down, cover the ground and create a type of mud which is suitable for the mushroom to grow. Season after season, the mushroom will grow and break out from the previous leaves layer. After the rains, the mushroom will stop growing. In Phu Quoc, the mushroom is cooked with shrimp, squid, and this is a common dish for the locals. If you look harder, maybe you can find some machete or swordfish to make fish balls, which is perfect for the mushroom. In Phu Quoc, there are many delicious cuisines such as fish sauce, Rose wine or pepper, but it also has the one special dish: Dried Shredded Shrimp Noodle. Dried Shredded Shrimp Noodle requires some basic ingredients such as thin noodle, herbs such as basil, cilantro, cucumber, bean sprouts, and raw papaya. The most important ingredient is the dried shredded shrimp and the broth made of fish. Coming to Phu Quoc, after days of eating grill seafood, a bit of noodle to change the flavor will help you enormously on the journey to enjoy everything in Phu Quoc. Visiting Phu Quoc, alongside with the delicious seafood is the delightful tuna soup cake that is sold every night on almost every street food. The delicious bowl of soup cake must have the equally delicious sauce—the famous Phu Quoc fish sauce to have with. The cake is soft and chewy, made from rice. 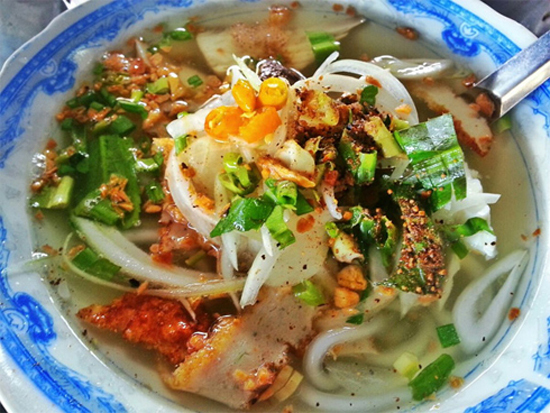 Nowhere in Vietnam has that had the better soup cake than Phu Quoc. Visiting Duong Dong market, the biggest market on Phu Quoc Island, you will see all kind of seafood from fishing boats from all over the place. But one thing special will emerge, the Mat Cat Sticky Rice Cake. In Phu Quoc, people here wrap the cake in Palma leaves (or mat cat in Vietnamese). The cake is green like emerald and is very delicious. The Palma leaves look like palm leaves, and are grown on Ham Ninh Mountain. The locals also use the leaves to make hats. It is strange that in Phu Quoc, there are a lot of banana leaves, which is the common wrapping for the cake, but the locals prefer to use the Palma. Unlike the sticky rice cake on the mainland, the cake here has a triangle-column shape. In order to make a perfect sticky rice cake, you have to dry the Palma leaves first, then wash and clean the leaves using oil. 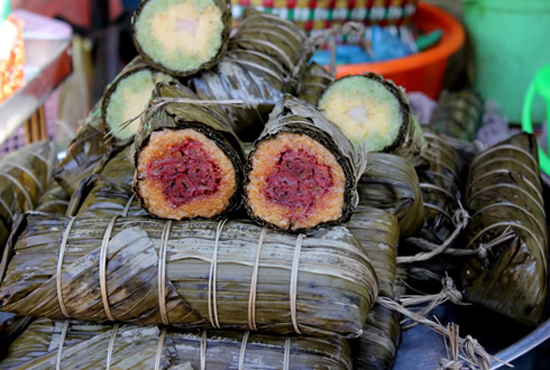 The sticky rice will have the color green thanks to the leaves. The smashed pea and pork are the core of the cake. The cake is meticulously made and requires a skillful pair of hands to complete it. Wrapping to tight and it will be undercooked or dried, to loose, and it will be wet. The cake doesn’t use coconut milk to make so it can last for a period of time. The price fluctuates from 5 to 10 thousands dong. The most famous cuisine of the island, the best fish sauce in Vietnam, and probably the world, Phu Quoc fish sauce is made from the best anchovies in the region with the formula that has been around for more than 200 years. The brand name “Phu Quoc fish sauce” is well known not in Asia but also in Europe and in America. 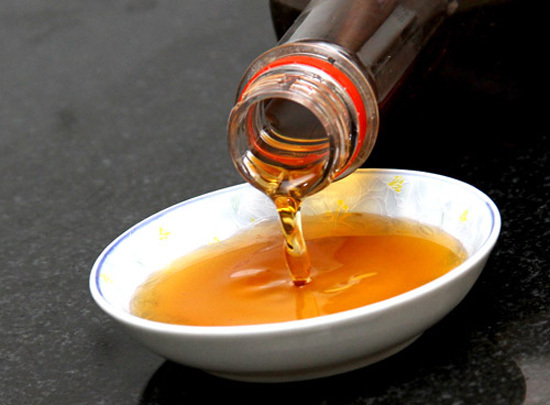 The fish sauce is made in a big wooden barrel, which served as a distiller barrel like in the beverage brewing industry, but the time to distillate is much longer, preferably a year. The barrel is made from bolly beech tree because the tree is soft without holes. The tree is a bit hard to find currently. The barrels are tightening by using Rattan palm tree that is abundantly grown in Tam or Bac Dao Mountains. Any fish can be used to make fish sauce, but the best to make the fish sauce is the anchovy. There are also many types of anchovies: Pepper stripe, chalk, red rice, lean rice, chalk stripe, charcoal. The formula is to mix 2 to 3 pounds of fish with 1 pounds of salt and left it for a year. The longer it stayed, the less sauce but with darker color. The locals also bury the barrels for 3 years, and the sauce is used to cure some special illnesses. If using spoilage, the sauce is not that good and the color is not very bright. Pepper is one of the best cuisines in Phu Quoc Island. The pepper is aroma and spicy, and much stronger than any other regions’ peppers. There are three types of peppers: skull, black and red peppers. Each has its unique characteristics but the strongest one is the red pepper. The pepper is collected manually when it ripe. 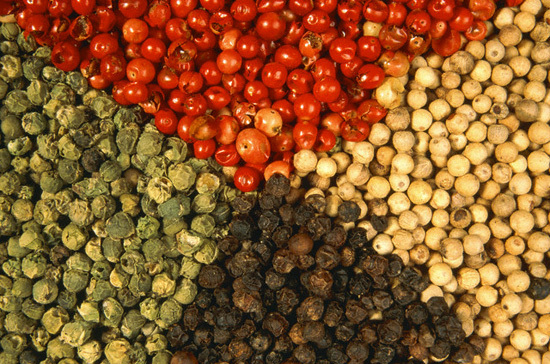 The pepper is the raw material for so many types of food in Vietnam and around the world. Phu Quoc is also the origin of the salt-pepper dip. Thanks to the pepper that is more flavorful than other regions, the salt pepper here is the best. Combined with some ingredients such as salt, sugar, frying pepper has the best quality that has no match. The salt-pepper is delicious for dipping fruits. 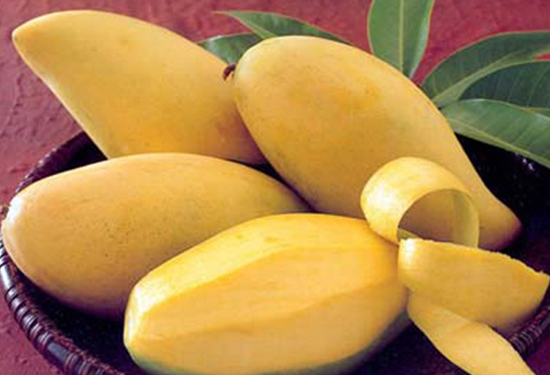 The mango is thin and long, and doesn’t look like other types of mangos, but it has a unique flavor. There are also many other types of fruits on the island such as raspberry and moringa which cover the forest with theirs fruits. Phu Quoc is not only the pearl with seafood but also a wonderland with fruits and other mountains cuisines.